When people are gathered together this holiday season, there is nothing that grabs others’ attention more than bucket-list stories about risk and adventure like bungee jumping, skydiving, car racing, river rafting, scuba diving, zip-lining, rock climbing, exotic vacations, and on and on. These activities are almost always met with awe and appreciation because we admire people who push their limits. There is no training manual for our care. We’re not professionals. We didn’t go to school to learn how to care for someone we love when they need our help. We’re on-the-job learners. We learn by our mistakes and we adapt in real time and we keep going. There is no set of instructions we can find that will help us figure out what we are doing. Each of our situations is unique. What we do makes IKEA instructions look like a breeze. No one thought through (nor could they if they wanted to) a set of instructions to guide us through the steps of caregiving. There are no steps. We are creating our own blueprint as we go. There is no safety net. You can easily read about the specific medical condition of a loved one. And you might have watched a movie about someone who faced a similar situation. But when you’re in it, when you’re caring for someone you love, you can’t control when it begins and when it ends. There is no practice session. No dress rehearsals to help you figure out how you’ll respond, let alone how others will respond. One day, without warning, you’re in it and soon enough, you can’t remember what life was like before. Our experiences are beyond pictures. We don’t have pictures to share of what we are doing or what we are experiencing with our loved ones. Pictures are for people who engage in public acts that can be easily captured. What would we take a picture of? A laugh of joy and simultaneous sadness? Physical presence? Picking up medications? Cleaning the house? Worrying? Talking? Watching? Seeking information? Protecting? Awakening in the darkness of the night with questions that do not have answers? Because caring is something we engage in everyday, pictures seem silly. Pictures are for the out-of-the-ordinary experiences, not the everyday. Our life is filled with the ongoing necessities of care, not the vacation moments that wow people. It changes you. When you care for someone you love, you can’t help but change. Not the kind of change most others might notice at first, but the kind of change that affects how you see others. What you find important. Trivial. Worthy. Worthless. Some friends will suspect something—“Are you okay, you’re not acting like yourself?”—but it will be hard for you to respond because how do you explain that the person you are now is so different than whom you used to be. 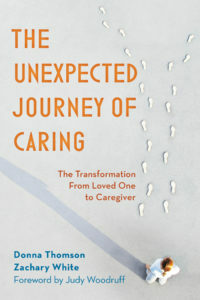 There is no radical transformation others can see in you—you might look the same—but caregiving is not like going on a roller coaster where it’s all about the adrenaline rush of what you did—it’s about the slow change of who you’re becoming. It’s not on anyone’s bucket list. Most people’s bucket lists are about things and goals they’ve dreamed about—travels to far away places and incredible feats of accomplishment. Caregiving is local. Everyday. Few people ever dream of caring for someone who is ill. Caregiving is about what currently exists—not what’s out there in the great abyss of possibility. It’s real, not imagined. It’s about the person before us, not about our ideal. It’s not about what we wanted, but what we accept as part of caring for someone. Sadly, the courage to care for someone you love doesn’t make the list of most people’s bucket lists. This holiday season, when everyone around the table is telling you what they did this year, or what they want to do, remind yourself that it’s okay if your care for another won’t make anyone else’s bucket list. You’re engaged in a journey few engage in. You are caring for someone you love without an instruction manual, where you have to adapt each day to changing and unexpected circumstances. It’s messy. And yes, it’s risky because you don’t care for something far away. You care for someone you love. No need for a passport for this journey. No brochures. No accolades or easy-to-translate Facebook posts about your itinerary. You are risking something most others can’t imagine—being so near someone you love when they need you most. The view may not be easily explained to others, but the view does take our breath away nonetheless. This is so so true and so well stated! When caregiving for my husband over many years, I always said I didn’t have a bucket list, because we would never be able to do things together. Now that he has died, I still don’t have a bucket list: all those bucket-listy things seem so trivial to me and don’t interest me. After what I’ve been through and what I’ve lost, the one thing on my b-list is heaven. Tears, only tears, and appreciation to you for writing what I’ve been feeling all these years. You nailed it here… exactly!! Thank you! And to Terri’s comment above… hugs & prayers for you! Thank you, Martha. Your words are inspiring. Truly. Thank you, Terri. You comments are so important and meaningful because they are formed from your experiences. So very true. I love your b-list priority. Zachary, thank you for this reminder that what is so worthwhile does not always show up in a picture. Thank you, Norris. I appreciate the ongoing support.